Though it is still a “small” junior miner, New Millennium Iron has heavyweight backing, huge resources and big production goals. From its beginnings as a capital pool company in 2003, New Millennium Iron has grown into an emerging producer controlling one of the largest iron ore resources in the world – the Millennium range, a 210km long taconite belt in eastern Canada. The company’s direct shipping ore (DSO) project in partnership with Indian steelmaking giant Tata Steel is first to development because of its smaller scale and relatively lower capital costs. When the DSO project goes into production by the end of the year, New Millennium will become an operating company with near-term cash flow. In 2013, the company is targeting 2 million tonnes (Mt) in production, ramping up to full capacity of 4.2 million tonnes per year (Mt/y) in 2014. Tata Steel Europe, which has plants in the UK and Netherlands, has committed to 100 per cent of the offtake at market prices from the joint venture company, Tata Steel Minerals Canada (Tata Steel 80 per cent: New Millennium 20 per cent). It’s a brownfield development located in the historic iron ore producing region of Northern Quebec and Labrador and had been previously operational until the market lost its appetite for lower quality of ore being produced by the operation. Dean Journeaux, chief executive of New Millennium, gets his share of questions on this point – what makes him think he can do better today? “The operator closed down the mine in 1982 because for one, the market was bad, but also, the product was not treated, not upgraded, running around 58 or 59 per cent iron. We are upgrading the run of mine ore grade to a 64.5 per cent iron, in other words, we are meeting today’s market requirements for quality, and of course, the price of iron ore has gone up quite a bit since 1982,” Journeaux says. Tata Steel is arranging financing for up to C$300 million of the capital costs, with New Millennium responsible for 20 per cent of the excess. The DSO project is just the beginning for the Indian steelmaker in Canada, and it will be using the experience as a tester before considering the far more significant Taconite project, which comes with estimated capital costs of between $4.4 and $5 billion dollars for each of the two deposits targeted for development. A $50 million feasibility study, expected to be completed by the end of the year, is underway for the two deposits, KéMag in Quebec and LabMag in Western Labrador. Tata has an option to develop either one or both properties, with New Millennium free to decide what to do should Tata not go ahead. LabMag is located about 30km northwest of the town of Schefferville, Quebec. About 1,800 First Nations people live in the surrounding area, a sizeable population that Journeaux says can go far in meeting the projects’ human resources needs in the future – the plant operators, truck drivers, mechanics, electricians and other supervisory, management and administrative personnel who will be required to maintain operations. On the DSO project, the JV, Tata Steel Minerals Canada, has an impact benefits agreement with First Nations groups. Apart from employment, the company is providing training and has donated $50,000 to run a bursary programme at the region’s secondary schools. 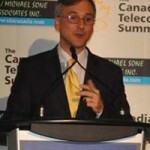 “I get asked if I am worried about the future labour supply considering the global skills shortage and I guess we are, but on the other hand, we have this tremendous asset in the surrounding communities and if we can encourage people through education and through other means, we hope it will bring them into the employment pool,” says Journeaux. For now, the company estimates that at least 1,000 people will be needed to operate at each of the deposits while facilities at Schefferville are insufficient to support such an influx of people. As a result the operation is expected to be fly-in, fly-out. LabMag is owned 80 per cent by New Millennium and 20 per cent by Naskapi Nation of Kawawachikamach through an initial investment, one of the first such arrangements with a First Nations group, and KéMag is 100 per cent owned by the company. Production is expected by the end of 2016, ramping up in 2017 for full production at 22Mt/y, of which 17Mt/y will be pellets and 5Mt/y will be pellet feed. The company expects to have grades of 69 per cent in the concentrate and slightly lower for the pellets. Journeaux explains that the operation will be able to make acid and fluxed pellets at various silica levels for blast furnace use as well as a low gangue direct reduction grade pellet. That, he explains, means the company can tailor the product to the demands of the steel industry. The Taconite project will be an open pit mining operation with a crushing plant, grinding and magnetic separation facilities with concentrate transported either by rail or in slurry form via 600km ferroduct to Port of Sept-Iles. 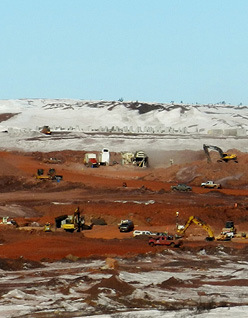 New Millennium is using engineering firm SNC Lavalin as the study manager for the feasibility study and has also contracted specialist German firm, Studien Gesellschaft für Eisenerz-Aufbereitung as its primary metallurgical process consultant while Midland Research Centre, in Minnesota, provides crushing, blending and characterisation work of samples. Journeaux explains that the process to mine and process Taconite was developed in Minnesota because the US state is home to the massive Mesabi iron range. Aside from Midland Research Centre, other Minnesota-based specialists have been brought on board. Barr Engineering will be doing work on the concentrator and the company uses the University of Minnesota Coleraine Minerals Research laboratory facility. As with the DSO project, Tata Steel Europe is expected to be a major offtake customer for the Taconite project as well, taking at least half of the product. The rest will be left for the open market. For that product to reach Asian markets, however, the Port of Sept Iles will need an upgrade for a deep water dock capable of handling ships with 360,000 to 400,000 tonnes of capacity. This last February, those development plans received a boost when the Government of Canada announced financial support of $55 million, or 25 per cent of the project costs, towards construction. “[The deep water dock] is under detailed planning right now…we need those larger vessels to lower freight costs so this is an important factor in our development plan,” he says. In furthering that development plan towards production, New Millennium’s board represents a broad range of backgrounds with experience in mining, accounting, business and marketing, geology, strategy and most recently, commanding the Canadian Armed Forces. General (Ret.) Rick Hillier, former Chief of the Defence Staff, the highest rank of the Canadian Forces, joined New Millennium’s board in 2011. If that seems surprising, consider this, what iron ore project couldn’t use a leader with a steady resolve who doesn’t waver under pressure? “He’s managed large groups of people and facilities, the logistics side, but a good part of the decision was that he is a Newfoundlander. We were trying to find somebody with good business sense, experience and who understands the area in which we operate, looking down the list [Rick Hillier’s] name certainly popped,” Journeaux says. He adds that the high profile appointment is a welcome boost in furthering the company’s vision to develop the Millennium Iron range into a world class mining operation. “New Millennium is a small junior mining company on the TSX Exchange but we have these very large deposits and we see it becoming another Mesabi iron range, which had eight or so mining operations at one time in different pits. We have this resource which will last for upwards of a century and the world’s iron ore resources are being depleted at a considerable rate, and also other factors, declining grades, quality. We have a brand new operation where we will be able to put out the highest quality products and all of this purports for a strong future for New Millennium and we hope that one day we will rank in the larger mining companies in the world, certainly in iron ore,” Journeaux says.